Based on customer feedback and with our own experience of over 20 years in the golf ball industry, Scott and his team, now sell golf balls online in three grades. Premier Lake Balls using this grading for new golf balls with no marks, they will be shiny in appearance although some balls may have a logo or ink spot. 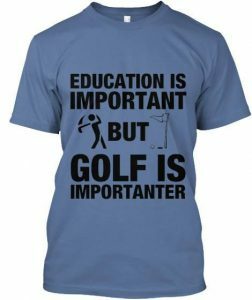 Ideal for the serious golfer! These balls will consist of golf balls like new and golf balls with minor marking, small surface scratches. Every golf ball placed in these packs could be played in competition golf. The A grade golf balls will look how a new ball looks after 6-9 holes. N.B. Based on the experience of handling 30-40,000 balls a week, all these packs will have at least 50% Pearl, that % goes higher on balls with harder covers that do not scuff as easy as tour calibre balls. These packs will contain golf balls that have a scuff\mark. Once you play 9-12 holes with a new ball it will start to show signs off abuse. 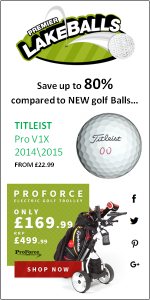 These balls are ideal for golfers who lose a few balls or anyone looking for friendly game \ summer night balls. So there you have it, grading lake balls is more detailed than we thought. However, buying used Lake Balls via a respected retailer such as Premier Lake Balls, will not only save you money at a time of economic uncertainty but it could also save the planet. 30+ Golfers from all over the South East of England gathered at the Essex-based club, all hoping to be TSG Masters 2016 Champion golfer. The members of the online social network had all qualified via a number of different means, some via the website’s monthly leaderboard. Some via other TSG Major events with the remaining spaces snapped up via the ballot and/or by special invitation with no one wishing to miss out on the first TSG ‘Major’ of the year. This made for an exciting competition and while some TSGers were familiar with the course layout, most were totally new to it. The field ranging from 6 handicappers to 30 (men and women) played the Childerditch and the Warley ’1 to 9′ loop, two very different layouts offering their own challenges. The latter including the superb 17th Par 3 signature hole across the water. The event was won by Essex based golfer (Harlow) Steve Slater, who also won the TSG OPEN at Bletchingley GC (Surrey) in July 2015. 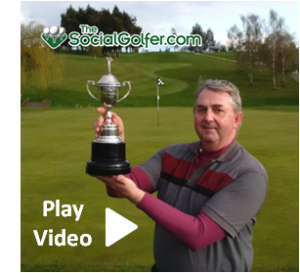 Slater is the first TSG golfer to hold two Major titles at the same time on the popular website. After 18 holes, Slater scored a hard earned 32 Pts off his 17-handicap but still needed to rely on the count-back to seal victory. Michael Moos 2nd (Herts – 32 Pts) and 3rd Brian Scott (Essex – 31 Pts). There was also some fun to be had with 2 x Nearest Pins and a ‘Straightest Drive’ keeping the day alive for those that were not troubling the leaderboard and a Par 3 Competition to add to the drama on the day. Other winners included popular ‘TSGer’ Denis Conway (Middlesex) with Slater also collecting the ‘Nearest Pin in Two’ and Moos also adding the Par 3 Trophy to his haul. The initiative, created by golf event specialist Doug Poole and the British Golf Industry Association (BGIA) aims to increase the participation in golf getting the 100,000 new or lapsed golfers to try golf in May 2016. 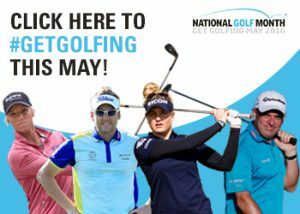 National Golf Month – What’s it all about? Firstly, there is a new National Golf Month website promoting the month hosted by newly launched activity booking site – www.fibodo.com. This will host all the offers available at your nearest club/range. Secondly, free coaching will be available at selected venues. And finally, there will be plenty of other golf discounts to take advantage of. In order to get this event in the public psyche, there will also be a media campaign combining radio, magazine and social media hitting over 25 million people, creating customers who wish to return to golf or learn to play. However, there are also some heavyweights putting their names behind the cause, including Paul McGinley, Ian Poulter and new kid on the block Charley Hull. Like all golf trips, it starts with one of your golfing buddies suggesting it’s time you went away for a few days without the family. 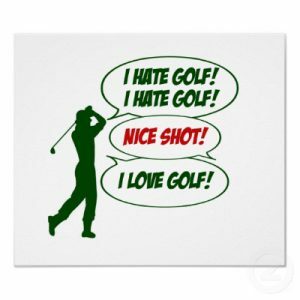 It then quickly moves to everyone saying which courses they would like to play and in which countries…. The next step is that one of you has to stop talking and actually go online and do the research, but where do you start? 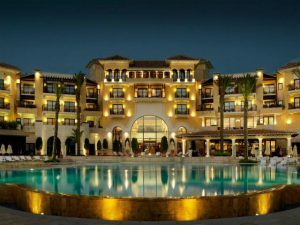 Despite the growth of new golfing destinations in the world such as Turkey, Morocco and some of the Central European countries such as Bulgaria, Slovenia and more lately Poland, Spain remains one of the most popular destinations for Brits to head for. The favourable exchange rate has helped in recent years to make it competitive against the ‘new kids on the block’ but it is the lure of some great golf courses that really keeps the punters coming back year after year. Since 2012 Spain has remained the no.1 destination for UK golfers and whilst the banks are now running many of the courses (following the crash of 2008), why do so many golfers return year after year? One reason is the guaranteed weather, however, just as important is the variation of courses you can play. Be your preference a desert course with testing winds or rock-lined fairways with great views or perhaps a flat bunker-ridden style layout that asks you to consider every shot. 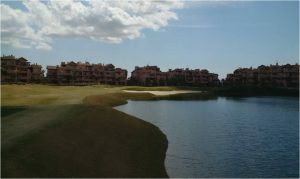 Having decided with my fellow explorer that it was a combination of all three of the above we wanted, we settled on spending four days at Mar Menor Golf Resort – part of the IRM Nike golf (formerly Polaris World). The quality of golf courses came highly recommended, as did the hotel group hospitality and amenities. The group hosts six golf courses, all ‘Jack Nicklaus’ designed, although only one was actually designed by the great man himself. 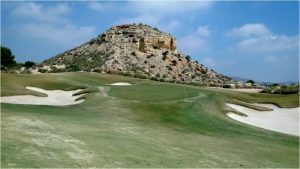 The courses include El Valle (Tournament Course) La Torre (Challenge Course), Saurines (Desert Course), Hacienda Riquelme (Championship Course), Alhama (Signature Course) and Mar Menor (Residential Course). N.B. It is quite common if there are less than four people playing in your group, that you will be partnered with other people. This speeds up play and can be good fun. So if you just want to be alone with your best golfing pals, ensure you only travel in groups of four. As stated above, this course is seen as the ‘jewel in the crown’ within the group. 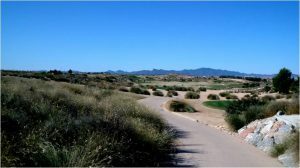 It is situated an hours’ drive from Mar Menor but is easy to find, thanks to the great directions given to us by the Pro-shop. At first, you are slightly disorientated on arrival as the course is within the walls of the residential area, however once this hurdle was navigated, you then arrive at an unassuming car park that leads to The Clubhouse. Wow! You know you are a course that has not only been designed by Mr.Nicklaus but that it has been sculptured beautifully into the landscape. I can only imagine how many hours the green keepers spend attending to all the tee boxes alone. The course is long (6500+ metres) but don’t be put off, most of the fairways are wide and forgiving but watch out for the wind. The course is built in a valley are when it blows, it really blows. The Clubhouse is modern but small and doesn’t match the surrounding but I believe this is a temporary structure and will be replaced by one much grander in style, just like the rest in the group. There is a fantastic open air range to hone your game before heading out. The first three or four holes are a delight, undulating fairways, bunker-ridden par 3’s but once you get past these, the course starts to stretch out (don’t think I hit a short iron into a green until the back nine!). Whilst the fairways are brown and barren (it is Spain), there is a good combination of left and right aligned holes. These contrast the greens are rich dark green and firm (i.e. very difficult to land your ball on). Of course, most have plenty of breaks and borrows, so don’t expect to leave without at least some 3-Putts on your card. Realistically this course is built for low handicappers (10 and below), so don’t be disappointed if you struggle to score well. Just enjoy the course, and the views and enjoy it in the manner in which ‘Jack’ would want you to. As you walk to the first, you immediately know you will enjoy the day. The vast wide fairway (with strategically placed bunkers) is beautiful with a mountainous backdrop that wouldn’t look out of place in the Arizona desert. The tee boxes again were very good and well tended to and cleared marked for all levels of golfer. As we made our way around we commented on how well the course was designed and that every hole provides you with a different challenge. Ranging from short-ish Par 4 to tempt you to expansive 450 m+ Par 5’s, this course has something for everyone. The course twists and turns with slight inclines and drops that won’t leave you out of breath. However, there are plenty of bunkers for you to find (on one hole we counted 10) so you will need to think your way around here. So to the signature hole: It does take a little effort to walk to the elevated 11th tee, that gives you a panoramic view for miles around. However, once you’ve taken in the view, you’re then faced with teeing off over rocks and on to the fairway 50ft below, where bunker will catch a wayward shot – brilliant! The greens here were very good. Not too firm that you can’t land on them but quick enough to get you thinking. All were true. Whilst water is not the main feature here, the back nine does require plotting your way around some pretty and challenging water but this all adds to the variety of holes. Finishing the day back on the patio area, we enjoyed some great service, good food and a refreshing drink, whilst we discussed the ups (there were no downs) of both the course and its layout. We will definitely be returning to this course again. We saved this course for the final day giving us plenty of time to enjoy a leisurely breakfast in the clubhouse, situated in the main Inter-Continental Hotel building. The staff were all very friendly and the service excellent. After meeting with Chris Ahern (Commercial Director), he quickly gave us a tour of the facilities and gave us some pointers on how to enjoy the course. The atmosphere here is very different to the other course and it has much more of a ’local club’ feel about it. The first tee situated less than a few yards from the clubhouse and offers you a simple Par 4 start but note the fairway doesn’t start for 150 yards, but don’t worry, the sandy fairway is plenty good enough to play from. The course then meanders around three or four loops, each returning to the main Clubhouse. The course is flat and has a layout that nicely rotates between Par 3’, 4’s and 5’s. This means you could play it again and again without getting bored. Upon reaching the back nine, water comes into play on holes 11, 12 and 13 circling a very pleasant reed-lined lake. Tricky if you tend to fade the ball as all holes are left to right but equally challenging to those that draw the ball, as each hole is also flanked by apartments. Having navigated these holes, you then return to a parkland style finish with the 18th positioning you back at the main clubhouse. The only negative we could aim at this course is that it looks a little tired in places but that comes from the fact that is the most played course in the group. However, this course is much shorter than the others and suits all levels of player. The food in the clubhouse is very good and the club-sandwich is to die for! All in all, we liked this course and we would happily return. The Villas here have been designed by the prestigious architect Melvin Villarroel and they are based on his concept of “Architecture of the Vacío“. This is the principle of where architecture and nature meet in a ’comprehensive design’ converging great garden areas with ‘exuberant’ vegetation in which the main hotel swimming pool takes pride of place. 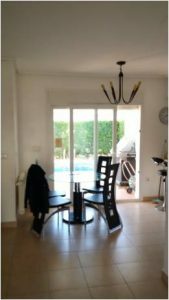 It’s excellent communication a few minutes drive from the best beaches of Murcia and close to natural landscapes and tourist routes, make this a special place for rest and leisure. 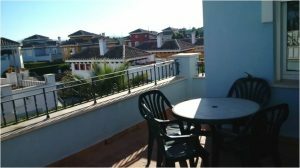 Staying in a privately hired villa rather than in the main hotel, these properties are available to rent either on short or long lets. They all come in various shapes and sizes but are all clean, modern and packed with everything you would expect, including air conditioning, dishwasher, patio furniture and some have their own private pool. The resort boasts three restaurants and an ‘Irish’ pub (full of golfing memorabilia) with a big screen, that normally shows golf. So you have plenty of choices to eat and the main Clubhouse bar also attracts many golfers back in the evenings. 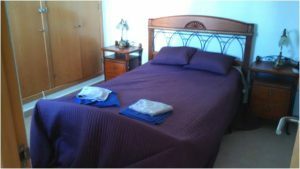 We hired a Villa privately on the main road into the resort with two bedrooms (sleeps up to 6) into the resort for £250 (four days) but this may vary depending on the time or year and availability. *rates shown are purely illustrative and will vary. 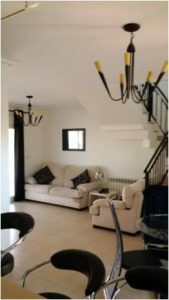 Flights to San Javier (Murcia) or Alicante can be booked at all the usual low-cost airlines from as little as £80 (book early) and Car hire was less than £50 for four days. Just remember to get your CDW (Collision Damage Waiver) cover before you leave, as they will try to charge you another £50+ at the terminal, despite it only costing £8 online. We spent four great days in the region enjoying both the golf and the food, and having previously visited a number of the courses in the area (including La Manga, La Finca and Las Ramblas), we can highly recommend this group of courses if you’re golfing in Spain anytime soon. 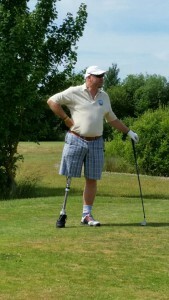 They will provide any golfer with plenty of challenges and enjoyment… and you are ‘almost’ guaranteed good weather! 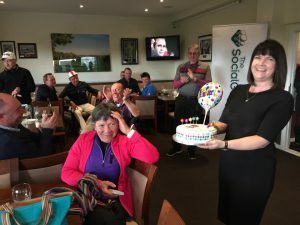 Golf Tourism England – South Devon Golf Tour…. 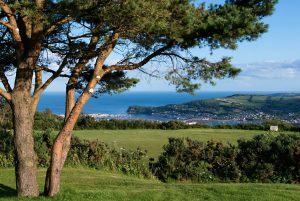 The cream of South Devon’s golf courses have combined to create one of Golf Tourism England most glorious and scenically stunning golf trails thanks to the photogenic south Devon coastline that is characterised by charming coves and estuaries and elevated cliff tops that offer panoramic seascapes. This mouth-watering collection of Thurlestone, Teignmouth, East Devon and Bovey Castle have all been designed by some of golf’s most revered course architects around the time of the ‘Golden Age’ of golf course design and will be known as the South Devon Golf Tour (www.southdevongolftour.co.uk). Located in an area of outstanding beauty, Thurlestone is a magical mix of links turf and cliff-top terrain and much of its location atop a promontory give it its breath-taking panoramas over the legendary Thurlestone Rock to the east and the picturesque Avon Estuary and Burgh Island in the West. Often compared to Pebble Peach, this Harry Colt design is by no means as severe thanks to its wide open fairways unless of course the coastal winds start to blow. Teignmouth, created by the famed Alister MacKenzie, also owes a great deal to its magnificent situation. Laid out on the high moor of Little Haldon over 800 feet above sea level, the outward nine looks over the town of Teignmouth and the estuary of the River Teign. whilst the contrasting back nine looks east over the Exe estuary towards Portland Bill, a well-known headland on the Jurassic Coast in Dorset. Whilst the contrasting back nine looks east over the Exe estuary towards Portland Bill, a well-known headland on the Jurassic Coast in Dorset. The course today remains remarkably similar to MacKenzie’s original 1924 design and retains his signature sloping greens, many of which are surrounded by humps on three sides and feature two tiers like many of those found at Augusta. East Devon Golf Club, perched on the cliff top 400 foot above Budleigh Salterton, commands stunning panoramas over the western end of the Jurassic Coast and the surrounding Area of Outstanding Natural Beauty. This 6,231-yard seaside heathland course with wide tracts of gorse and heather dividing each fairway was designed by the great Herbert Fowler, with later input from both Harry Colt and James Braid. Its defining characteristics include well-drained fairways, close-cropped turf and firm, undulating greens that make it a fair and enchanting golf course, though testing when the sea breezes comes in off the sea. Finally, the inland retreat of Bovey Castle provides an interesting contrast to the coastal tracks thanks to its setting in amongst the mature woodlands of Dartmoor National Park. Designed by JF Abercromby to rival its sister courses at Gleneagles and Turnberry, Bovey Castles opened to great acclaim in 1930. The challenging, yet beautiful course meanders through the estate whilst the luxurious accommodation and five-star facilities of the castle mean the resort is regarded as one of England’s most idyllic destinations to play golf. “You could not find a more spectacular group of golf courses so conveniently located together in one of England’s most popular and jaw-droppingly, glorious coastal locations” comments Andrew Cooke, CEO & founder of Golf Tourism England. 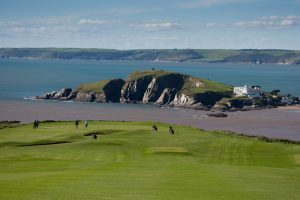 The development of the South Devon Golf Tour will be helped by the fact that the group has a dedicated golf tour operator working alongside them. Graham Ruth of Exclusive Golf Breaks will provide golf packages to the area as well as marketing the tour to his clients and to golfers around the world via the website, www.southdevongolftour.co.uk. South Devon can be easily accessed by car via the M5 whilst visitors from northern England, Scotland, Ireland and Europe (including France, Holland, Spain, Portugal and Italy) can reach the county by air via direct flights into the international airport at Exeter. The South Devon Golf Tour is another example of Golf Tourism England driving golf clubs and resorts to club together and to market themselves as a group to the multi-billion pound golf tourism industry. To book a golf package to the South Devon Golf Tour, visit www.southdevongolftour.co.uk or call +44(0)1822 618181. First established two years ago in order to promote England as one of the most outstanding golfing destinations in the world, it represents the multi-million-pound golf tourism industry. Golf Tourism England is now the recognised body that represents every aspect of the golf tourism industry in England and is taking a leading role in the development and marketing of the industry on an international stage. England’s golf offering is a strong and immensely viable one: it is after all home to over 2,500 golf courses, many of which are widely recognised as some of the finest in the world. It has four courses on the current Open Championship roster with two other courses having staged the event in the past, it has staged The Ryder Cup 14 times over nine different courses and plays host to The European Tour’s flagship event, the BMW PGA Championship. England also possesses some of the oldest golf courses in the world that boast a rich history and tradition that cannot be reproduced and has over time turned out some of the most illustrious professional golfers in the history of the sport.